Smart-lock for android is a handy feature which adds an additional layer of security to Android device. After you have identified and created safe conditions for the phone to unlock, this smart lock automatically unlocks it without any user-intervention. At the same time when you carry the phone out of the safe zone, the smart lock feature will lock it automatically. So this is a one-step forward towards automation, Don’t you think so? These how-to DIY steps will definitely throw some light on the available options within smart lock feature. To enable smart lock functionality, go to settings on your phone and tap on security, here you will find smart lock option. Tap on it and it will ask you security PIN/pattern/fingerprint (whatever security you have set before). Now you will see the following four smart lock options. This is the first method on the list of smart lock options. Tap it and simply turn on the feature to use it. Once you enable it, you need to unlock the phone first time manually and the pone will remain unlocked as long as it is in your pocket or your carry-bag. The sensors are used to detect the body movement and accordingly the body detection works. The only drawback in this feature is that the phone will be unlocked irrespective who is carrying this. It will detect the body, whether it’s yours or somebody’s else. This is one feature that you are going to like a lot. You can add a location to your home or office which you think is safe by using integrated google-map. You can add more than one location and your android phone automatically unlocks whenever you reach the geographical co-ordinates of the added location. Using this option, you can add another phone as a trusted device. Whenever your phone connects to this added android device via Bluetooth, your android phone automatically gets unlocked. This is again a handy smart-lock feature which prevents you from using your fingers again and again to unlock the phone. To enable this smart lock functionality, just tap on the trusted device on the screen and add a device from the Bluetooth connected devices in the list. You must pair the other Android device before it appears on the list of devices. 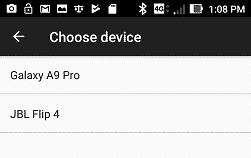 As you can see in the screenshot, I have two devices on the list, one is Samsung A9 pro and another one is JBL Flip 4 Bluetooth speaker systems. With this feature, you can unlock your Android device through your voice. Once the phone detects and matches the sample voice already saved with google, the phone gets unlocked. To activate the feature, you need to say “OK Google” in the microphone 3 times and turn on the feature that says “Unlock with Voice match”. Unlocking a phone was never so easy but with smart lock feature you need not swipe or draw pattern every time to unlock your phone. You just need to setup once and your intelligent phone will do the locking and unlock for you. Have you ever used any of the auto-lock features? Do share your experience with us.